Partners: AirClic Inc., Newtown, Pa.; Nextel Communications Inc., Reston, Va., and Raytheon Co., Waltham, Mass. Goal: The St. Louis Metropolitan Medical Response System wanted to be better prepared to respond to a major emergency or multiple-casualty accident by giving first responders, hospitals and others access to real-time information. Obstacle: In the chaos surrounding a disaster, it can be hard to assess casualties and make informed decisions about how and where to treat them. The St. Louis response system had to ensure that patients went to the right hospitals, and that no hospital became overcrowded. Solution: St. Louis adopted Raytheon's Emergency Patient Tracking System, a combination wireless network and Web-based application that allows EMS workers to collect information about patients and allows command centers and hospital staff to track the patients' progress from the scene of the accident to the emergency room. Payoff: Using Nextel handsets and AirClic barcode scanners, EMS workers can upload information into a centralized database from barcode bracelets that the patients wear, so the system always knows where they are. Using the Web application, administrators can balance the load of patients among area hospitals and improve survival rates in the event of a disaster. David Gellen of Raytheon demonstrates the company's Emergency Patient Tracking System. When IT professionals think load balancing, they think of hardware and software that keeps network traffic from overrunning a single server. For St. Louis first responders, load balancing means ensuring hospitals don't become inundated with patients in the event of a disaster. Last April, the St. Louis Metropolitan Medical Response System launched a $500,000 system developed by Waltham, Mass.-based Raytheon Co. that helps first responders, doctors and other emergency personnel trace patients from the scene of an accident to the hospital. "We primarily designed it to track people so we could know where to find them," said Jeff Lowell, chief of the St. Louis system. "We wanted to load balance so we don't get hundreds of people all going to the same place." Raytheon's Emergency Patient Tracking System is similar to the system a company such as FedEx uses to track packages. The system combines specially equipped wireless devices, a Web application and a back-end database to record and report patient status. "It can be deployed in any of the more than 120 metropolitan medical response systems throughout the country," said David Gellen, director of marketing in Raytheon's Information Management and Dissemination Systems division. Metropolitan medical response systems are federally funded programs to help local governments improve their response to disasters and other emergencies. "It can also be used by other agencies to track just about anything else you want to track, such as shelters for the Red Cross, blood supply, personnel, anything," he said. For the St. Louis system, Raytheon partnered with Nextel Communications Inc. and AirClic Inc. Nextel handsets were equipped with AirClic barcode scanners and deployed to roughly 20 emergency response teams throughout the metro area. Raytheon chose Nextel handsets in part because they would function in the event of a large-scale catastrophe. "Because our devices don't operate over the public-switched network, they continue to work in the event of a disaster such as Sept. 11," said Leon Frazier, Nextel's vice president of public-sector sales. 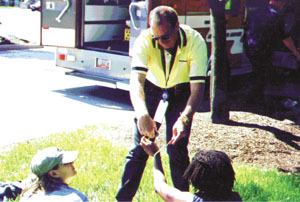 When emergency workers arrive on the scene, they put barcode bracelets on the injured and enter information about patients on their Nextel phones. The devices run a simple Java application that can record the patient's condition, hospital destination, ID number and other data. This information is uploaded over Nextel's wireless data network and recorded in the patient tracking system. When an ambulance is ready to take a patient to a hospital, the EMS worker scans the bracelet with the AirClic barcode scanner. When the patient arrives at a hospital, the bracelet is scanned again and the information is updated in the system. Once the information is in the system's database, it is accessible to authorized users through a secure Web browser. Hospitals, command centers and other support agencies track patients and their conditions through the system. In this way, administrators can balance patient loads among hospitals, or route patients with specific injuries to hospitals that are better equipped to treat them. The Nextel handsets also incorporate global positioning technology, so command center workers can see exactly where patients and ambulances are on a digital map of the region. "It's not just a disaster system," Lowell said. "It's an all-day, every-day system. Everyone in St. Louis who is transported by the city medics has a barcode bracelet put on, and they're scanned and entered into the system." According to Gellen, the Raytheon system is secure and complies with the Health Insurance Portability and Accountability Act requirements that patient information be kept confidential. "Every time someone touches a record, you have an audit trail," he said. The Web applications and database run behind a firewall to prevent unauthorized access. Although the St. Louis system uses Nextel handsets, Gellen said agencies could build a similar system with any wireless device. Raytheon is demonstrating a proof of concept for its tracking system in New York, where emergency personnel would use their existing 800-megahertz trunk radio system. Raytheon is also deploying its Emergency Patient Tracking System in New Jersey. The system is highly scalable, Lowell said. St. Louis will increase the number of Nextel devices in the field from 20 to 100. He plans to roll it out to all the counties in the St. Louis bistate region, which includes Illinois. Lowell also has plans to add new capabilities to the system. The next revision will add patient insurance information, he said. And his agency is considering an application that will allow the system to validate the credentials of first responders and health care personnel who arrive at the scene of a disaster or large-scale accident. Although Lowell said he can't measure his return on investment in dollars and cents, the Raytheon Emergency Patient Tracking System is important to his agency's operations. "The risk of not having a system like this is very high," Lowell said.